One of the many names for Sri Lanka was Ratnadipa, island of gems. A great ruby given to the Queen of Sheba by King Solomon is said to have come from the island. A gem adorning the Ruwanwelisaya Dagoba at Anuradhpura was described in 1293 by Marco Polo as ‘a flawless ruby a span long and quite as thick as a man’s arm.’ The crown of the British monarch contains a 400-carat blue sapphire known as ‘Blue Belle’ that was mined in the then Ceylon. The mining operations we visited in Sri Lanka represented all the types of gemstone mining, including pit, mechanized, and, in this case, river. 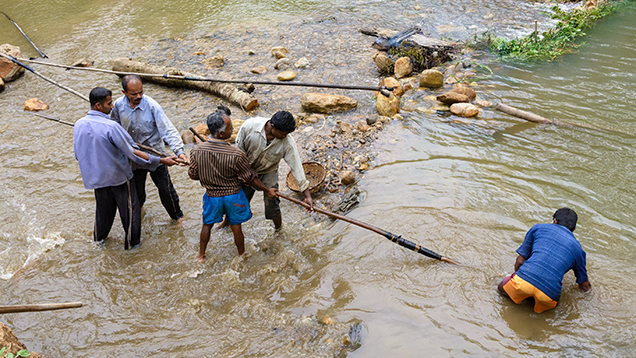 The abundance of precious stones in the countryside around what became known as the town of Ratnapura, a name meaning city of gems, makes it still the centre of gem mining even today. 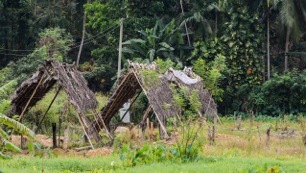 The plains and abandoned paddy fields near the town are dotted with thatched awnings, each one marking the location of an active gem mine. These mines look crudely built but they follow a traditional design that enables near-naked miners working at the bottom to pass up gem-bearing gravel to the top in baskets. This gravel is known as illam. It is washed in shallow reed baskets that allow the mud and water to fall away, leaving the heavier gravel. This is sifted thoroughly, and frequently yields pieces of rock that experts know immediately are the source of the gems they seek. The gravels yield sapphire, ruby, cat’s-eye and other chrysoberyls, spinel, garnet, beryl, tourmaline, topaz, quartz, and many other gemstones. 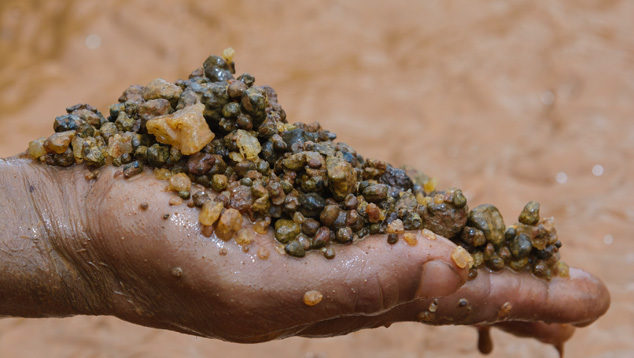 Sri Lanka’s gem-bearing gravels are some of the richest in the world. The island was blessed with geological conditions that provide an ideal blend of chemistry, heat, pressure, time for gem crystals to grow, and weathering for the gem crystals to be deposited and concentrated in gravels. Small gemstones are sold directly to dealers, while larger ones are auctioned. The auctions are almost silent affairs as the bidding is done by a complicated system of handholding and finger tapping. Proceeds are shared according to a traditional formula with 20 per cent going to the owner of the land where the mine is located, 20 per cent to the owner of the pump that keeps the mine workable, and 10 per cent to the holder of the licence to mine. The workers involved share the balance, and also share half the income with their own backers. Mining licences in Sri Lanka are regulated by the National Gem and Jewellery Authority (NGJA) and about 90 per cent of the licences issued each year are for pit-mining operations using traditional methods. The remainder go to river and mechanised mining. Licencing for mechanised mining follows very strict guidelines. 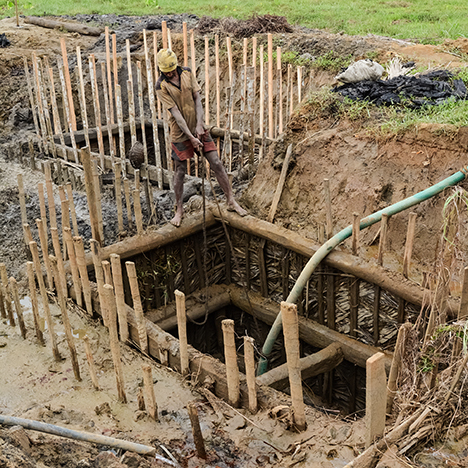 Most pit-mining operations in Sri Lanka are relatively small vertical shafts. Mining relies on human muscle power and not mechanization. Many of the licencees have four to five traditional mining pits on their property. It’s estimated that more than two million pits have been dug over the last 50 years. Compared to gem mining in many African countries, there are hardly any unfilled, abandoned pits. This is partly because the NGJA collects a cash deposit when a licence is issued. If the mine owner does not rehabilitate the land after mining is complete, the NGJA uses the deposit money for that purpose. It takes expertise, learned by trial and error over the years, to identify gemstones and to estimate their value once they are cut and polished. While lapidaries exist in Ratnapura, many traditional gem cutters and polishers are established on the west coast, dating from the days when precious stones were a prime export from Sri Lanka. Hence there are gem cutters and reputable jewellers in Galle, as well as wholesale gem merchants in China Fort near the old Beruwela harbour on the west coast. (See Blog, March 2015). If, like most visitors to Sri Lanka, you don’t know anything about gems but fancy buying one as an incredible souvenir, how do you know if a gem merchant is offering you the genuine thing, and not a piece of polished cut glass? If you buy a gemstone from someone who sidles up to you in the street while you’re in Ratnapura, you may be disappointed. It’s best to shop only in long-established jewellers such as those in brand name hotels or who advertise in tourist magazines. Jewellers with the genuine product will be happy to offer a certificate of authenticity. If you want a further guarantee that your stone is real, the NGJA (25 Galle Face Terrace, Colombo 3) is a government institution with a free testing service. INSIDE SRI LANKA A monthly insider’s report by Royston Ellis, October 2015.